When it comes to retail assortment there is a question that's crucial for both growth and profitability. How large share of your assortment should consist of Private Label Brands (your own brands) vs. National Brands? The name of this post might be simplifying things a bit – your strategy might that of private label only – or the opposite. But let’s assume you keep both private label and supplier brands in stock – whats the optimal share of Private Label Brands in your assortment? There are numerous factors that affect the answer. Let’s start with some simple pros and cons. Since there are obvious pros and cons of both, you want to strike a balance between the two. Now, after all we are the promotion geeks, lets take a real (disguised) example that examines the promotion profitability for Private Label Brands versus National Brands. 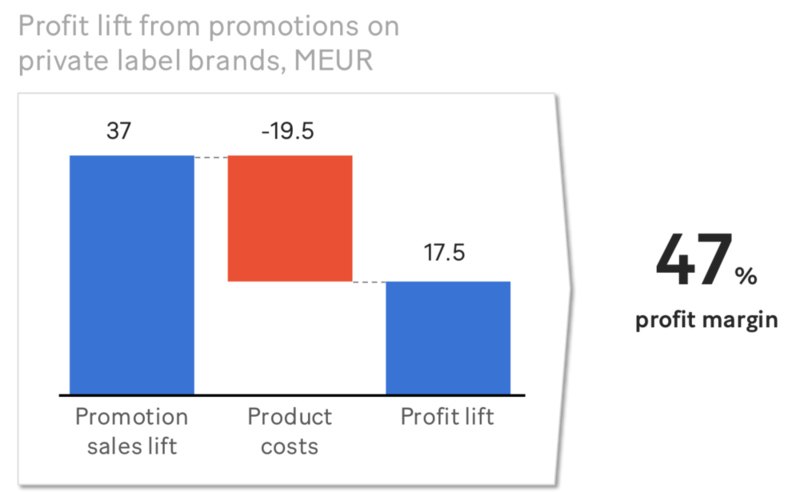 In the picture below, we look at the promotion sales lifts (MEUR) for a retailers' Private Label Brands and their corresponding product costs. Looking pretty healthy right? A sound and solid profit margin of 47%. Now look at the sales lifts and their corresponding product costs for the retailers' National Brands on promotion. Not as nice. The product costs are certainly eating a lot of that good promotion sales lift. Now it looks much better. 42% profit margin instead of 16%. Still the Private Label Brands, in this particular case, leave you better off with a campaign margin of 47% vs. 42%. improve the profit margin as a whole for this particular retailer. So this was a case example, but isn’t there some good research on this topic? Of course there is. In fact there’s been quite a lot of research into this topic. In a paper by our good friend professor Koen Pauwels and his colleagues, published in the Journal of Marketing, this particular question is examined. They followed looked consumer behaviour of >4000 consumers in the Netherlands, and how their share of wallet was spend across different retail chains. The key question was: how did the level of Private Label Brands affect the consumers share of wallet. That is, could you find optimal share of Private Label Brands? The study finds that an optimal level is somewhere around 40%. The effect follows an U-shaped form, so up to that point increasing your private label share increases the share of wallet. Interestingly this is also much consistent with the hypothesis from our case study. So what is the optimal level of private label for your retail business? Tricky question. But there is a way of approaching the answer, and it begins with putting your data to work.